The Maryland School Nutrition Association takes pride in Fueling Tomorrow's Future... Our Friday evening Awards Banquet on October 5th, 2018, is all about our state's school nutrition heroes. Come to the convention on October 5 & 6, 2018, for an excellent opportunity for networking, fun and recognition. Enjoy our photo montage of last year's Award Banquet by clicking here. Click on photo at left to the meet MdSNA Employee of the Year. For a printable flyer of our award descriptions and deadlines, please click here or on the flyer photo above. The MdSNA Innovation Award recognizes individuals who have developed an innovative idea, process or program within their school or district that adds value or streamlines operations. County winners will be judged by MdSNA awards panel to be selected as the state winner of the Innovation Award. This award is unique to Maryland. There is no regional or national competition for this award. Nominations for this award are due to your local county Food and Nutrition Service Office designee by May 31. Nominations for this award are due to the MdSNA awards chair by July 31. Click here for award application. The Rhonda Motley Gold Success Award is presented to an outstanding school foodservice employee who has created a positive impact on school nutrition. County winners will be judged by MdSNA awards panel to be selected as the state winner of the Rhonda Motley Gold. Nominations for this award are due to your local county Food and Nutrition Service Office designee by May 31. 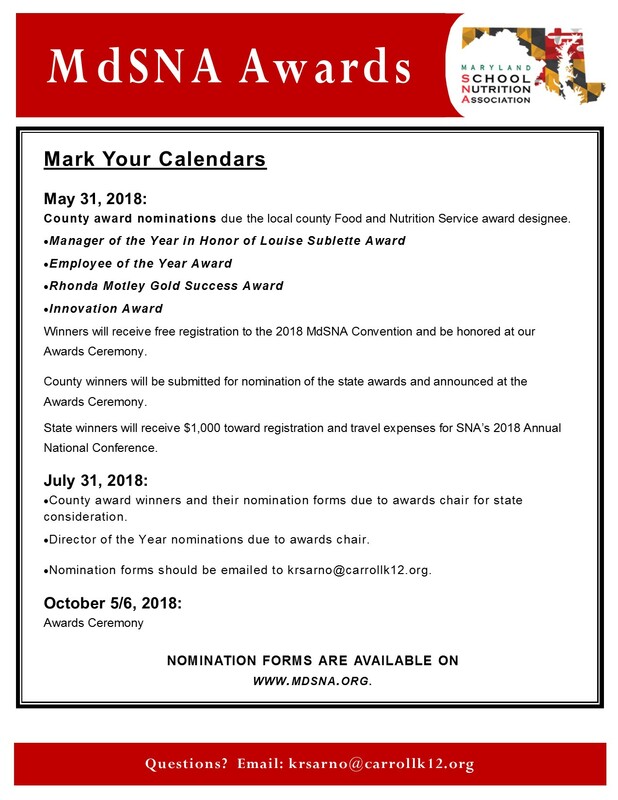 County award winners and nomination forms are due to the MdSNA Awards Chair by July 31. This award is unique to Maryland. There is no regional or national competition for this award. The MdSNA Employee of the Year Award recognizes a non-managerial school nutrition employee for the contributions he/she has made throughout their nutrition career. This is a great opportunity for counties to recognize a employees and bestow deserved recognition for a job well done, and for others around the state to be inspired with ideas for their own programs. MdSNA Employee of the Year is automatically submitted to SNA as Maryland’s National Nominee. The MdSNA Manager of the Year Award recognizes an MdSNA member manager who has made a notable contribution to the success of the school meals program in his/her school. This is a great opportunity for counties to recognize a manager and bestow deserved recognition for a job well done and for others around the state to be inspired with ideas for their own programs. MdSNA Manager of the Year is automatically submitted to SNA as Maryland’s National Nominee.Award details and application coming soon. The MdSNA Employee of the Year Award recognizes an outstanding Director for the contributions he/she has made throughout their nutrition career. Click here for award nominee form. MdSNA would like to recognize at our fall convention your county schools whose employees have 100% membership in our state association (MdSNA). In order to participate, fill out this form (make copies if you have more than one school with 100% membership) and email or mail it to our Executive Secretary. Remember, to qualify for the MdSNA 100% Membership Certificate of Achievement, all regular food service personnel in the single unit/school unit must be a member of MdSNA on or before May 31st of this year. learn of the achievements of the winners. Gary Childress, supervisor of food and nutrition for Harford County Public Schools and current president of the Maryland School Nutrition Association, is in the national school nutrition spotlight for earning the President’s Award of Excellence from the School Nutrition Association (SNA). “This was truly a team effort, as Maryland had a great day at the opening session of the School Nutrition Association’s annual convention,” said Mr. Childress. “Our state had the National Employee of the Year and National Manager of the Year along with this award. We are so proud of what has been accomplished this year and are looking forward to continued success and recognition of the hardworking, dedicated school nutrition employees in Maryland. 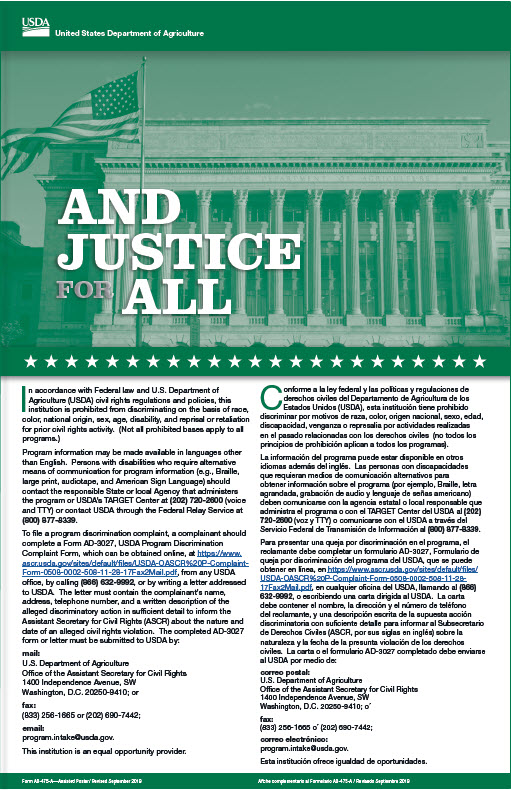 These people deserve to be acknowledged as they care deeply about the students they serve.” In order to provide equal opportunity for states of different sizes, the President’s Award of Excellence may be awarded to one state president in each of the three member divisions: 1-500 Member Division; 501-1000 Member Division; and 1001+ Member Division. Mr. Childress won for the 501-1000 Member Division. MdSNA is excited to congratulate Carroll County Food and Nutrition employees on the recent article published in the Carroll County Times, honoring their hard work promoting healthy meals for students. Click here to read this article and take ideas from it to promote healthy meals in your own counties. Way to go, Karen Sarno!